Anyway, I finally have a post with this skirt! I had it for at least 6 months, maybe more, but I don't know why I never wore it, it was on my closet and I almost forgot about it until I saw it when I was cleaning stuff. Sinon, enfin un post avec cette jupe! Je l'ai depuis au moins 6 mois, voir plus, mais je ne sais pas pourquoi je ne l'ai jamais mise, c'etait dans mon armoire et j'avais presque oublie son existence jusqu'a ce que je la retrouve quand je faisais du rangement. The outfit turned out well! Cute skirt and shoe(I like the color). check new post on my blog!! Woow je love !!! c'est une robe ou une jupe? Ca me donne des idées coutures tout ca :p !!! Beautiful posts and very nice blog! Congrats on your work! La tenue te va bien! J'hésitais à acheter ce genre de jupe j'avais peur que ça fasse vite abeille lol! mais tu viens de me prouver le contraire! Merci Diane!!!!! Ca fait plaisir!! Je visiterais volontier ton blog! stunning, the color looks uber stunning on you. Love that striped skirt and yellow pumps! BTW, totally love the concept of a soundtrack in your blog! Thank you, I'm glad you do!! Dee my bee! j'aime trop ce look! ta jupe je la veux! Merci ma cherie!!! T'es toujours adorable! You look gorgeous!! that striped skirt is so chic and I also love your heels!! Great outfit, I'm also obsessed with bodycon skirts they look great on any bodytype! Thank you so much, and I agree!!! The stripes are great on the skirt, your outfit is so pretty :) now following. Nice yellow stripe skirt you wore! Is that skirt one set with the black top or it is separate? I can see why you love bodycon skirts...they look great on you. thanks for stopping by mine's. oh yah, it looks like a bee! lol! so cute skirt! looking gorgeous! love this bee-like skirt! looks lovely on you! PS: you are rocking that outfit babe! I love your cardigan! haha, this outfit is really fun! My dear Diane i love the look of your blog! the outfit is awesome! 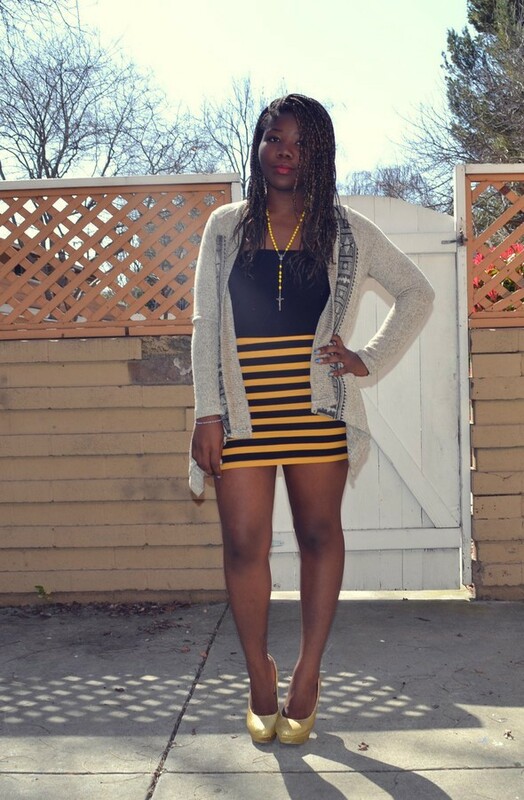 i love how you combined the cardigan to your beautiful bee dress, perfect! lav yah always dear! Thank you my dear, love ya! love how you put your outfit together! already hype you on lookbook! would you do the same:)? So pretty! Love your skirt, supppper cute!! Love this look...I'm also posting black & yellow today!! Would love you to check out my blog...if you love please follow & I'll follow you back!! You are a lovely bee :) That's a great skirt!! In love with this look the heels the skirt are so pretty Gorgeous love it from head to toes sweetie looking forward to see more of your outfits. Merci :). Oui c'est moi qui l'ai customisé la housse d'iPhone ^^. N'hésite pas à venir jeter un petit coup d'oeil. Cette tenue est cool !